The Bardex Lubricath Latex Pediatric Catheter provides for smoother insertion and enhanced patient comfort through the hydrogel coating’s unique ability to absorb fluid, thus creating a hydrophilic “cushion” between the catheter surface and the urethra. 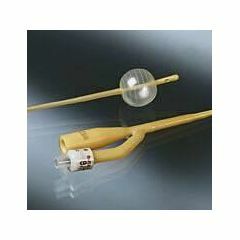 This Lubricath catheter is a much smaller size for use with infants. With the hydrogel, the barrier created provides more comfort and less irritation.